The Environmental Supply Co. 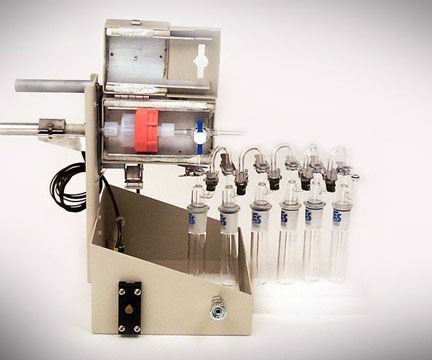 Method 26 sampling system is for the determination of Hydrogen Halides such as Chloride, Fluoride, Bromide and Hydrogen Halogens such as Chlorine and Bromine. Method 26 uses midget impingers and a constant nominal sampling rate of 2 liters per minute with a recommended minimum sampling time of one hour. The sysytem comes with miniature impingers, heated probe assembly, and a modular clamshell oven. Method 26 sampling system uses the UNI-VOS-ACD Low Flow Control Console with Digital DGM. 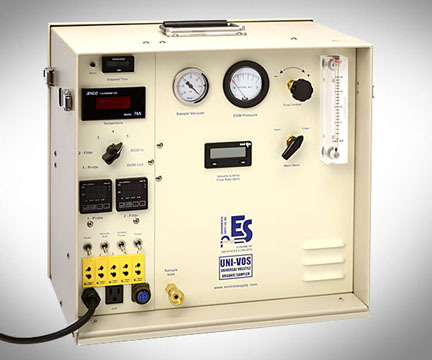 The UNI-VOS-ACD is the ideal metering control console for accurate volume measurements in the performance of low flow gas sampling methods requiring sample rates between 0.5 to 2 liters per minute. Flow rate adjustments, gauges and temperature readouts on the console and the 0.01 Liter resolution of the dry gas meter allow the tester to maintain a constant and accurate flow rate while monitoring gas meter pressure, and five remote temperatures received from the sample caddy.